3... 2... 1... BOOM! 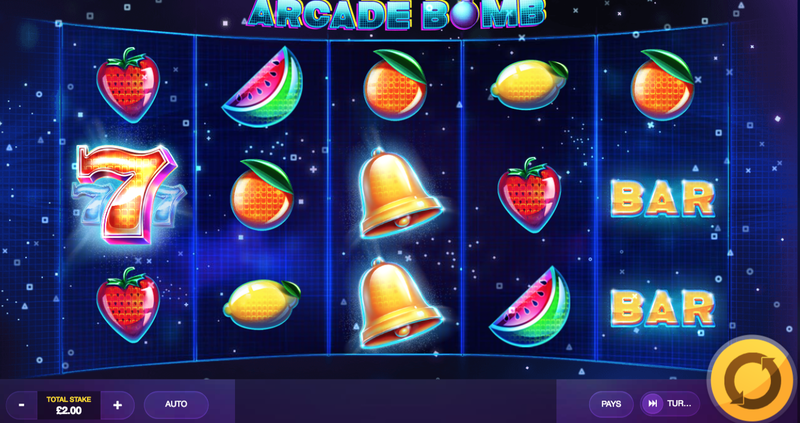 Arcade Bomb is a 5 reel, 20 payline slot with a classic fruit machine theme. 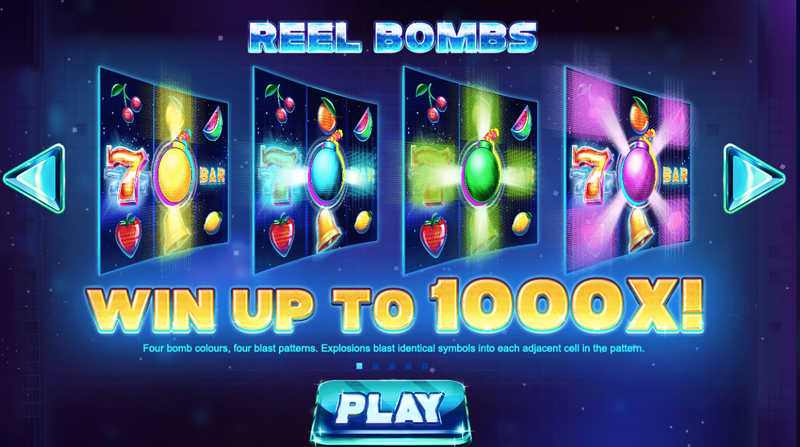 There is a slight explosive twist with this fruity slot with the addition of exploding bombs that blast throughout the game to create winning combinations right here at EasySlots. The design is very futuristic-looking and it almost looks as though it is set in space with the intergalactic background. It has a much more interesting design compared to other fruit machine slots which makes a nice change. Gameplay is fairly straightforward as you simply have to match symbols adjacently to win. There's also an exciting locked reel bombs feature where symbols lock into place for bigger wins. Arcade Bombs is a 5 reel, 20 payline slot created by Red Tiger Gaming. This online slot has a popular fruit machine theme with a fruit bomb twist. Watch the fruits explode all over the reel every time you win. The design is fun, futuristic, and colourful. Behind the reels, you'll see a blue galaxy filled with billions of tiny stars. Symbols include pixelated fruits such as sweet strawberries, tasty lemons, tangy oranges, juicy watermelon, and red cherries. There are also lucky red 7s, golden bells, bars of gold, and bombs ready to explode. Fruit Symbols - The cherry is the lowest paying symbol in this slot. Landing 5 on a line will award you 24x your stake. Next are the lemons and these pay out up to 32x your stake. This is then closely followed by the oranges which award up to 36x your stake and then the strawberries which award up to 40x your stake. The highest paying fruit is the watermelon and this awards up to 50x your stake. Gold Bars - The golden bar is the next best paying symbol after all of the fruits. This awards up to 120x your stake. Golden Bells - This is followed by the golden bells which award up to 120x your stake. 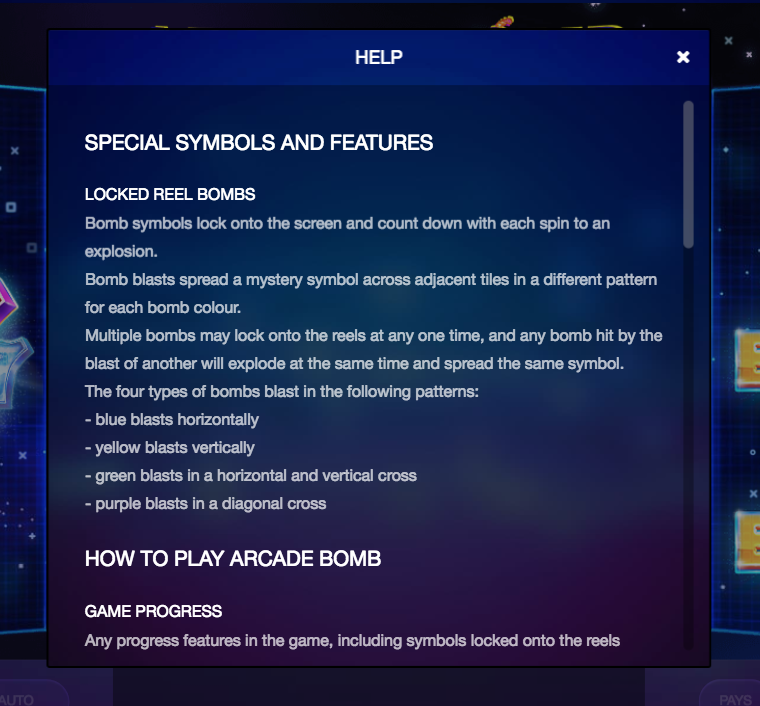 Lucky 7s - The lucky 7s are the highest paying symbols in Arcade Bomb. Landing 3 lucky 7s will award you 100x your stake, landing 4 will award you 250x your stake, and landing 5 will award you 1, 000x your stake. Locked Reel Bomb Feature - Multi-coloured bombs will drop onto the reels every time you hit spin. This will cause the reels to lock into place. Each bomb has a number attached which determines how many spins there are until it explodes. Why not join & spin today? Red Tiger Gaming has been creating exciting games for the online casino world since 2014. Even though they are relatively new to the online gaming scene, this does't affect the quality of their games. Red Tiger Gaming is very passionate about creating slots that all gamers will love. Arcade Bomb is very different from the standard fruit machine slot games UK. The design is out of this world with its space theme and pixelated fruits. The addition of the explosive bombs makes this slot super fun. This slot offers some great prizes including a multiplier of up to 1, 000.